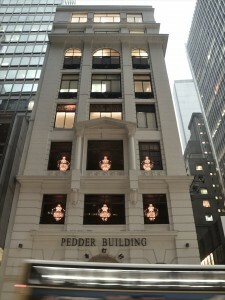 Designed in 1923 by Palmer and Turner Architect, Pedder Building is one of the last colonial era buildings in the heart of Hong Kong’s Central district. Surrounded by modern skyscrapers, this narrow eight-storey house is characterised by neoclassical elements – arches, columns, sculpted medallions, classical balustrades and steel windows. Although the Pedder building has been classified with a Grade II historical status by the Hong Kong Antiquities and Monuments office, this does not mean that the future of the building is secured. Rather Grade II listing only requires the owners to “preserve the building selectively”. In practice means this that: “demolition works or building works such as alteration/ renovation works which may affect the heritage value of the building are not encouraged”. While the British Government passes strict preservation laws at home, in Hong Kong the colonial officials often sided with property owners and developers. In the city’s feverish property market where land is at the premium, many of the privately owned historical buildings in Hong Kong are intentionally allowed to degrade into a state of despair. The Pedder building has mainly been a commercial building for shops, clinics and offices and for seventeen years with Shanghai Tang’s flagship store occupying two of its floors. In 2011 things changed dramatically when Shanghai Tang lost the bid for its space to Abercrombie & Fitch, which reportedly agreed to pay over HK$7 million ($900 000) – two and half times the previous monthly rent. Shanghai Tang was forced to move out. Soon other small businesses followed. Now some of the world’s most established art dealers have their gallery spaces in the Pedder building. Gagosian, Pearl Lam and Simon Lee have their Hong Kong branches there, and the last one to move in was Lehmann Maupin, who took up a space redesigned by Rem Koolhaas in March. During Art Basel Hong Kong last week the international art crowds invaded the building when the Pedder-based galleries hosted their opening all on the same evening. Because architecture serves as a visual evidence of a city’s putative identity, with the demolished buildings also cultural memories are erased. Thus the preservation of the city’s old colonial architecture – or its destruction – needs to be read against Hong Kong’s search to find its own historical and cultural specificity and subjectivity. Pedder building’s new life as a home of Hong Kong’s top art galleries can be read as an embodiment of a wilful re-invention. When in the past it was mostly known for cut-label fashion shops selling factory rejects, today it has become a symbol of a creative, dynamic and global Hong Kong – aiming towards excellence and high culture.